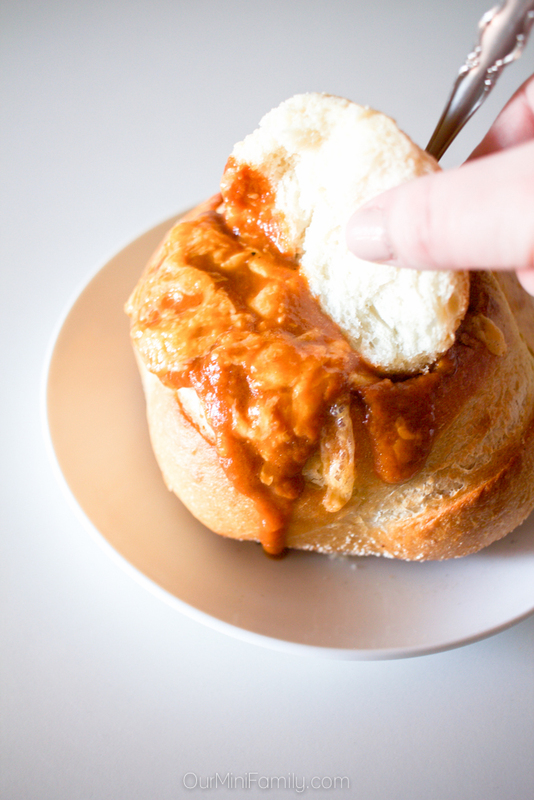 Warm up and get cozy this winter with this decadent, grilled cheese tomato soup bread bowl recipe idea! It seems that our chilly winter days here in Phoenix are numbered! The forecast predicts that it is going to start to warm up again very soon, so I am fully embracing what little bit of winter we have left right now. This weekend, I'll be staying comfy and cozy while I get some major chores done around the house as we prepare for a long work week next week. Nothing says cozy like warm, cheesy comfort food. Especially when it combines two of my favorite kinds of winter comfort food: grilled cheese and tomato soup! This grilled cheese tomato soup bread bowl is a fun spin on the traditional pairing of a melted cheese sandwich with tomato bisque. 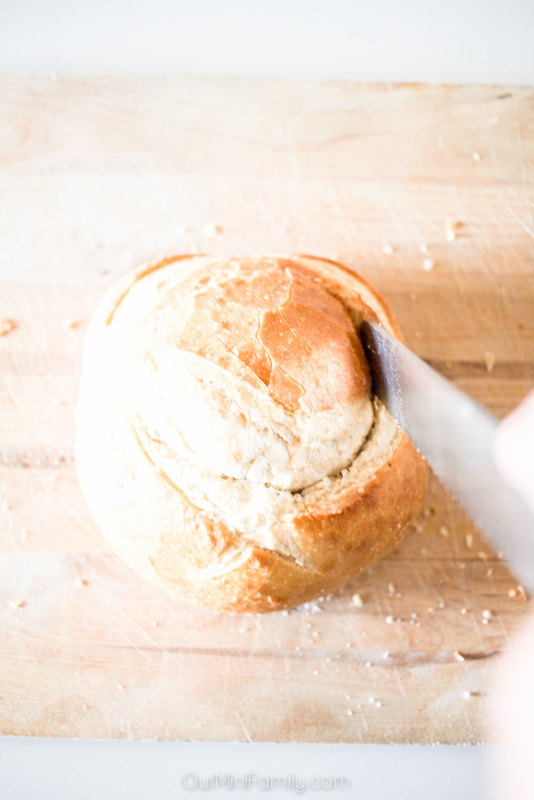 All wrapped in one sourdough bread bowl, this recipe is sure to keep you feeling cozy this winter while you bundle up and prepare for the last snowfall of the season! Warm the soup in a stovetop pan on medium-low heat. Cut a somewhat deep hole in the middle of the bread bowl. Be careful to not puncture the bottom of sides, as you do not want the soup to be spilling out of the bread bowl. Remove and set aside the excess bread and save it for dipping. 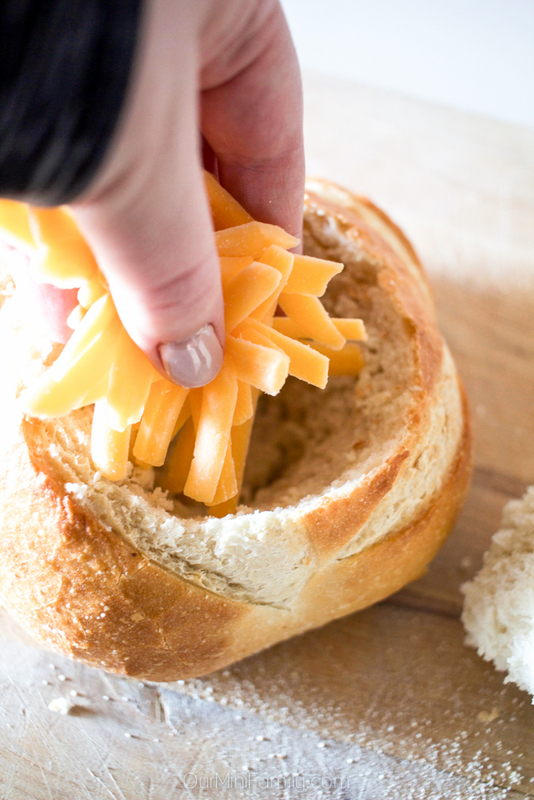 Put 1/4 cup of cheddar cheese in each of the bread bowls. Warm the cheese inside the bread bowl in a conventional oven or toaster oven--I recommend using a bake setting as opposed to a broil setting, as you do not want to burn your bread. I like to warm the cheese at 400 degrees with the bread sitting on a baking sheet and on the lowest rack in the oven (to help avoid burning). 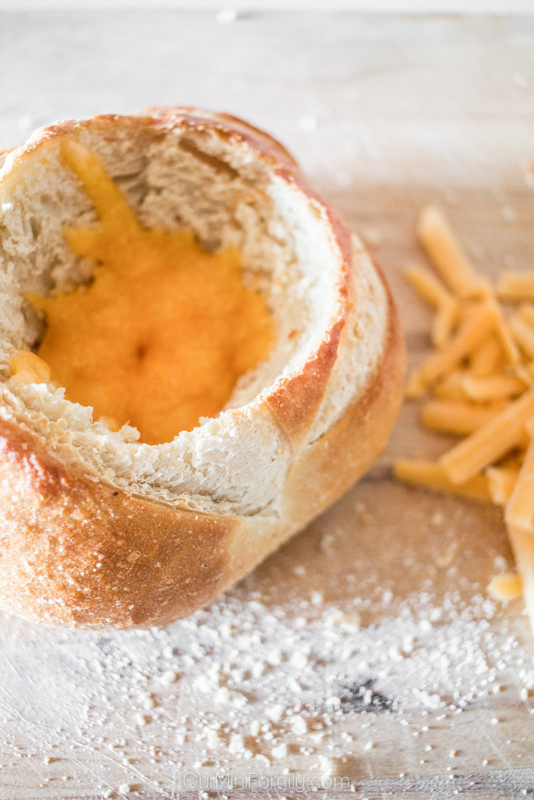 Once the cheese inside the bread bowl is bubbling and melted, remove it from the oven. 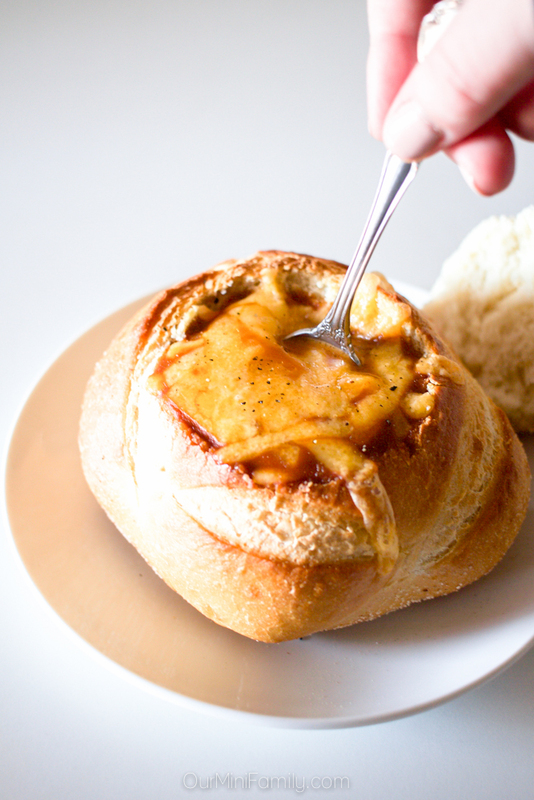 Pour the 1 cup of soup into each of the bread bowls, and sprinkle the remainder of the sharp cheddar on top. Carefully place the bread bowls back on the baking and set them back into the oven to allow the top cheese to melt (i.e. 400 degrees on the lowest rack on a baking sheet). Once the cheese sitting on top of the soup is melted, carefully remove them from the oven, set them on a large platter or serving plate, and sprinkle the bread bowls with crushed black pepper. Serve immediately and enjoy! Don't forget to save this on Pinterest and Facebook! Tomato soup and grilled cheese are one of my favorite combinations, especially on a cold day. This twist sounds absolutely delightful. first, your photos are amazing. Second, now im hungry! Such a simple idea - why have I never tried this before? It looks amazing... Now all I need is lovely sourdough bread. Yum yum! this looks amazing! It's supposed to snow here Sunday and I think this is the perfect recipe! This looks amazing! It's a great twist on the everyday soup and sandwich! I think this will be something I have to try! This is the best soup bowl ever! Grilled cheese and tomato soup is one of the best combos in the history of food, so I can't wait to try this. WOW, I just ordered a grill cheese/tomato soup dish yesterday but, I've never thought to combine them both in bread. This sound so delicious and simple to create! Tomato soup is perfect for these cooler days where weather is changing and we feel sick. I love bread bowls too, I haven't had soup in a bread bowl in years. 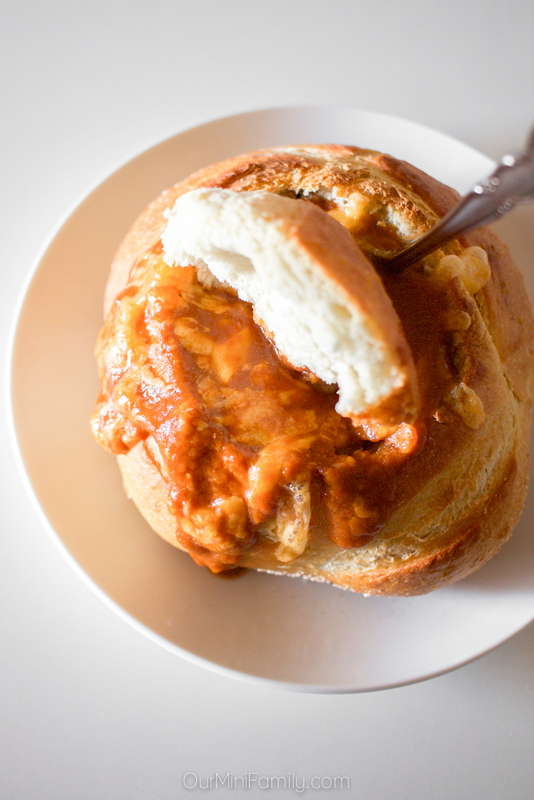 I am going to have to try this grilled cheese tomato soup bread bowl asap! That looks delicious and I love the extra cheese in there, some at the bottom and the top... yum. Perfect meal on a cold winter day. This looks like such a yummy and fun twist on a classic! Definitely will have to try this soon! How cute are these! I love simple and fun ways to create ordinary things. I am definitely putting this on my list of foods to try.